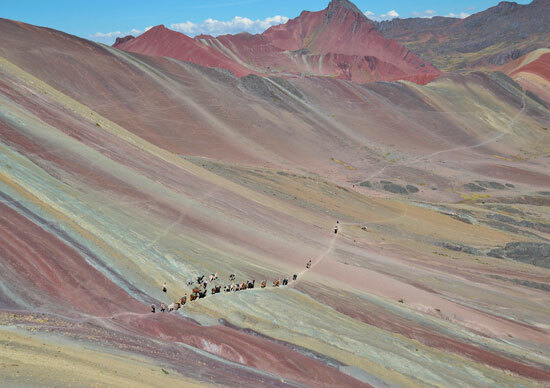 Classic Rainbow Mountain Peru 2 Days. Is very excited to be able to offer the Classic Rainbow Mountain Peru 2 Days; located in Cusco, round trip by the same place and arrive during the sunrise at Vinicunca that will satisfy to the most demanding trekkers and will get unforgettable memories as sumptuous panoramas of high mountain, formidable glaciers surrounding the Colorful mountain, peaceful pastoral scenes of the herds of spangled and alpacas kept on by Andeans and multi-coloured clothing. This Classic Rainbow Mountain Peru 2 Days r route is a true adventure for acclimatization, through a nature preserved and wild, where the only meetings gonna be by Vinicunca the “The Rainbow mountain”, small communities of Quechua-speaking-Inca descendants and our Customers. The Classic Rainbow Mountain Peru 2 Days achieves a circuit of scale, passing by collars located between 4310 and 5200 masl, overnight camping, between the mountains, to avoid the massive groups and to see the rainbow mountain, then turn over to the starting point of the circuit. 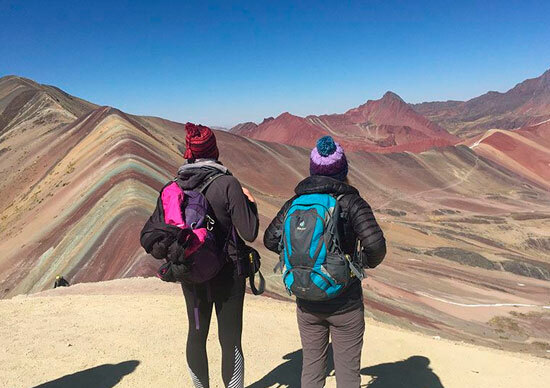 Exploring on Classic Rainbow Mountain Peru 2 Days a remote path, you will see few or seldom any trekkers , so you have this southern extension all to yourself.However, the Classic Rainbow Mountain Peru 2 Days, is able to offer travellers a hiking alternative that is second to none. A fabulous note!, With no restrictions to book! Vinicunca The Rainbow Mountain (overnight). Ausangate (The Andean Worldview´s most important Sacred Mountain). Travel Style: Trekking, local communities, highest mountains, shepherd’s paths.